Murray Hochman is a self-taught painter who has developed a significant body of work over the course of more than 50 years. While his early paintings were recognized by leading galleries and collectors, for the past two decades Hochman has kept himself at some remove from the art establishment, letting his own processes, both internal and external, and his materials shape his work. In 2012 he left his studio in New York City and continues to work from a converted barn in the Berkshire Hills of Massachusetts. Hochman has a B.A. in Art History from New York University and an M.A. in Fine Arts from Alfred University, where he studied ceramics. Though he quickly turned to painting, his fascination with surfaces remains evident in his work. 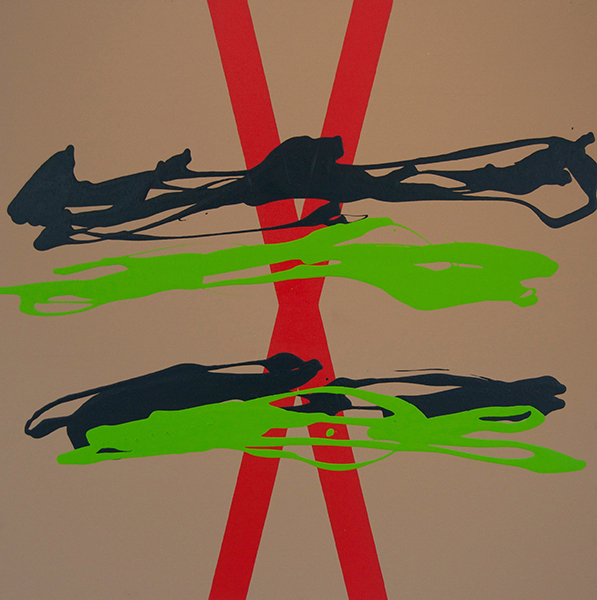 Over the years, he has explored the possibilities of light, color, geometry and gesture, using lacquer and solvent-based paints and, more recently, collage, to build subtle, richly layered surfaces. His most recent paintings, a series called X Factor, grew out of his search for a less toxic medium. The use of acrylic paint has brought a new immediacy and spontaneity to his work. The starting point and conceptual basis of individual paintings is a letter of the alphabet, to which he adds an expressionistic element. The use of color is bold and often unpremeditated, resulting in surprising combinations.